Katie’s messages were focused on Truth shared in practical & applicable ways. Katie did a great job. Our women loved her! Katie used humor as well as points we could easily remember. We love her genuine, every day, real life message. I love conferences and retreats! I’ve seen God move mightily through these gatherings and it is an honor to be a part of them. If our schedules fit, you can expect a well-prepared, Word-centric, Spirit-led teaching talk for you and your women. 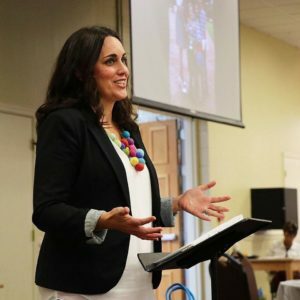 From compelling keynote Bible-teaching sessions addressed to hundreds of women, to practical equipping breakouts where I teach women how to dive into the Bible for themselves, I have decades of speaking and teaching experience, and I LOVE every minute of it. Click here to request me to speak at your event. Why do people make such a big deal about theology? Do I really need to pay attention to it? Who am I? What really happened when I became “saved”? How do I live out these truths? What am I supposed to do with my life? How do I figure out God’s will for my life? How do I experience faith, hope, peace, and obedience in my day-to-day? Fill out the Speaking Request Form below with your event details and I will get back with you soon. I’m looking forward to chatting with you about how I can serve you and your women!